Even Ana's own mother thinks she's a nosoul, an omen of worse things to come, and has kept her away from society. To escape her seclusion and learn whether she'll be reincarnated, Ana travels to the city of Heart, but its citizens are afraid of what her presence means. When dragons and sylph attack the city, is Ana to blame? Sam believes Ana's new soul is good and worthwhile. When he stands up for her, their relationship blooms. But can he love someone who may live only once, and will Ana's enemies—human and creature alike—let them be together? 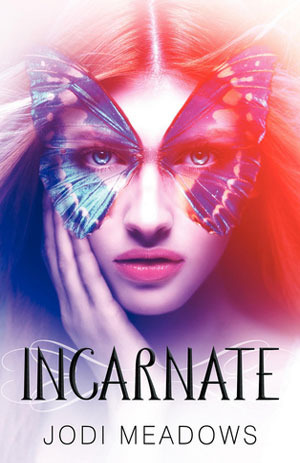 Ana needs to uncover the mistake that gave her someone else's life, but will her quest threaten the peace of Heart and destroy the promise of reincarnation for all? I know that I am pretty late coming into this series and I don't understand why that is. Love the cover art and the concept sounds pretty interesting. Luckily, for me, this baby was on sale on Amazon not too long ago and I was able to read this one on my Kindle. And, boy, did I read it quickly. Ana has to be one of the sweetest and yet interesting characters I have ever met. Usually I'm not into all of those sweet and innocent characters, but she did have this all self-loathing complex and was also courageous at times, so she did keep me guessing about her. I loved how her character grew throughout the book, how she became a character that wasn't so meek anymore. My only issue would be about how fast she fell for Sam. Granted, I really did love their relationship, but I just didn't understand how a girl that was so suspicious could suddenly trust one guy. I mean, I get that they spend all this time together, but I would have figured that a girl with such a past wouldn't be so quick to have romantic relations with someone. Besides that, this book was absolutely magical! I looooveed the imagery and the plot. I didn't expect what came along in the book, either. Dragons that spit out acid, these invisible-like monsters that scorch your flesh off . . . absolutely terrifying, and not what you'd expect with such a pretty cover and such a sweet heroine. But it was a good terrifying and it made for a very original and entertaining book. The world that Meadows created was something entirely different. I wouldn't exactly call this a dystopian because there's a lot of fantasy elements thrown in there, so that's why I'd categorize this as more of a fantasy book, considering that fantasy can take place in the future, present, or past. I really just wanna hug this book because it was such an enjoyable quick read! The concept that souls will always come back, and be reincarnated was fascinating, and the fact that both or either of the soul mates could be a different gender when they came back from the dead was fantastic. So, if you've not read this book yet, I do suggest you do. The world building and the imagery was enchanting and I can't wait to read the next book!